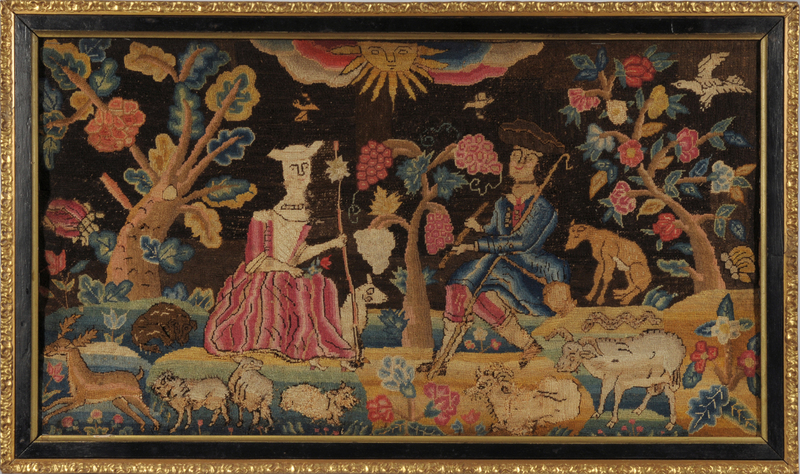 STEPHEN & CAROL HUBER, Old Saybrook, Conn. Hubers@AntiqueSamplers.com 860-388-6809 This large rare pictorial needlework, Shepherd and Shepherdess Courting Scene, features a shepherd and shepherdess in a bucolic setting with sheep near her and rams near him. The inclusion of a leaping stag, dogs, birds, whimsically stylized trees and sun greatly add to its charm and appeal. Likely from the Boston area, the dark brown filled in background, sun and some of the flowers are found in other Boston canvas-work pictures, and the design characteristics of this needlework and the poplar backboard is indicative of an American origin. It is wool on linen canvas and measures 15¼ by 27¾ inches framed.